What if you forget to take something? What if you’re trying to take baby out too early? Is there a right time to take baby outside? These are just some of the questions first-time parents ask themselves. It can be daunting, but here you’ll discover everything you need to know about taking your little one out for the first time, along with some great tips and advice. When Can Baby Go Outside? 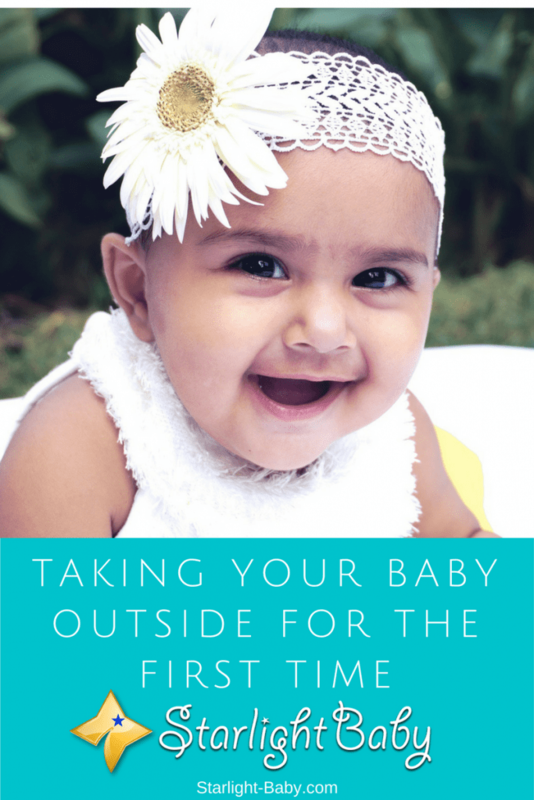 The main question you’re likely to have is when you should actually take baby outside. It’s easy to forget your little one has already ventured out with you on the way back from the hospital. It may have only been brief, but you still took them outside. There is no set time and babies certainly don’t need to be kept indoors for days or weeks before they can go outside. So, basically whenever you are ready that’s when it’s time. However, there are a few recommendations on how long you should venture out for. It’s a good idea to keep initial outings to around 30 minutes or 45 minutes’ maximum. This gives you both a chance to adjust and take in the new experience. It’s also a good idea to avoid going into crowded areas. While there is no reason healthy babies can’t go outside, you do need to be careful they don’t pick up any germs. In crowded areas there’s a risk somebody could be sick and the germs will easily pass onto your baby. Their immune systems aren’t fully functioning so babies do get sick quite easily. Another thing to watch out for is the weather. If the temperatures drop below 20 degrees or over 90 degrees, it’s a good idea to stay in. You may never feel fully ready to take your baby out for the first time. It can be a terrifying experience. However, the secret is to be prepared. When going out with a newborn, even for short periods of time, there’s a lot of things you need to take with you – especially if you’re going to be out for more than an hour. You’re going to need changing supplies such as diapers and baby wipes. If your outing coincides with feeding time, you’re also going to need to take some formula or breastmilk with you. It’s also a good idea to take a change of outfit in the event of any accidents. Depending upon how long you’re going to be outside for, it may even be a good idea to take two changes of outfits. If you’re wondering what your baby should be wearing for your trip, take note of the weather. On cool days, it’s best to keep baby’s feet, hands and head covered. You can layer their clothes just like you would when it’s cool. That way, if it warms up you can simply take off a layer when needed. On particularly cold days you can also take a blanket or jacket. On warmer days, light clothing, a shade on the stroller (which typically comes built in) and sunscreen is a must. Is Fresh Air Good For Baby? Fresh air is great for babies. Not only does it provide a change of scenery that can really help soothe your little one when they’re being especially fussy, but it can also help to build up their immune system too according to some pediatricians. As long as you follow the advice above and avoid large crowds and people you know are sick, it can be great for your little one’s immune system to get outside for a while. Sunlight in the early mornings is also great for baby’s skin. Remember to use sunscreen as there’s still a risk even in low sunlight, that your little one’s skin could burn. However, when properly protected the early morning sunlight can provide good levels of Vitamin D, helping to keep your baby healthy. Overall, there isn’t actually a set age you should and shouldn’t take your newborn outside. It all really depends upon how comfortable you are. You’ll know when you are ready to take the first outing. It could be a week or a day – just do whatever feels right to you. I do think that 30 minutes or 45 minutes is enough for going out the first time. For example, my wife will deliver the baby in the middle of the next November, so outside will be very cold, it may be snow and very low temperature, so, I think that taking out our baby will be for not more than 15 minutes a day! Good point there, wallet. The amount of time spent outdoors also largely depends on the weather. You wouldn’t want your baby exposed to a freezing condition or to a really hot day. Parents should be very observant and careful when taking the bay outside for the first time. Taking the baby for first time is a bit terrifying. But after you overcome that first time moment everything will be alright. Adjustment that you will be used to it. Start from your garden probably having a good sunlight and freshair. Later on your check up appointments. Until you will enjoy all those moments. Treasure every moment because baby’s griwing so fast as day goes by. Your post is very educative. I have seen most parents in my neighborhood take their babies out in the morning when the sun is not hot yet. Just sitting with their little ones at the balcony or veranda for some extra vitamin D.
Being prepared well for the outdoor activity with the baby is a crucial step. Although most parents start by going out with the baby just for the sun, I was wondering at what age of the baby should we start introducing them to sunlight. Babies are very delicate and extra care should be taken when a parent is looking to take his or her baby outside for the first time. Personally, I believe that there is a particular months a baby should reach before being taken outside. And if it’s paramount that the baby should be taken outside, the parent must prepare well while embarking on such task in not to be caught unawares by some certain things. The weather should be taken into consideration, because it’s not how it affects adults, is how it affects the babies. They shouldn’t be exposed too long in my opinion because their skin cannot endure sudden change of the weather conditions. Here in us the baby will go outside if ts dawn or 8am to 9am were they can get sunlight. Sunlight in that time has a nutrients that can help the babies. Since there were no good medical facilities in the town I lived, we traveled to another city for the delivery of our child. We traveled back to our town when the baby was 25 days. It was a 12 hours journey in a car. Now we are back to the city again and we traveled for 12 hours with the baby. The baby enjoyed the ride.